Are you still struggling to cite your sources when it comes to genealogy and family history research? Do you understand the value of citing source BUT you just need an easy way to do it? When I started on my genealogy over 40 years ago, I was a “name collector” and I didn’t cite my sources nor did I understand the value of citing sources. 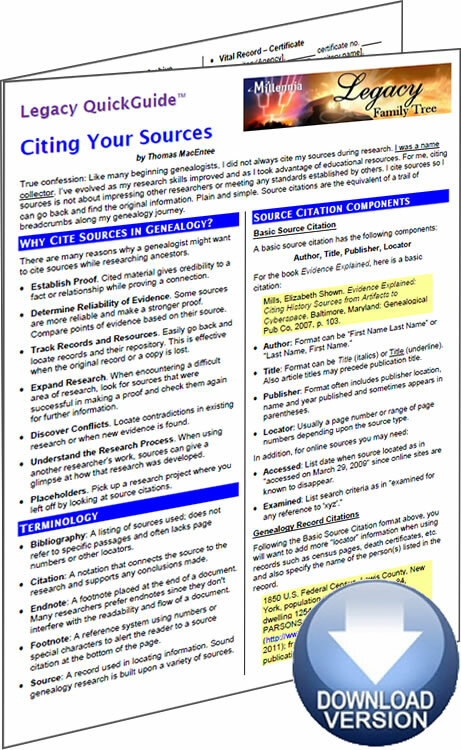 Whether you are new to citing sources or you just need a “refresher,” I’ve created an easy-to-use guide at Legacy Family Tree entitled Citing Your Sources. Through a special arrangement with our friends at Legacy Family Tree, I want to make sure that every genealogist has access to this important information. That is why Citing Your Souces is available as a FREE DOWNLOAD starting Friday, October 20th through Sunday, October 22nd, 2017. Click HERE to get your PDF copy now! NOTE: You will need to sign in with your Legacy account or create a free Legacy account in order to download the guide. “After years of doing genealogy research, many are now realizing the importance of creating source citations in order to locate the source of a record. Whether you are using a genealogy database program such as Legacy Family Tree or you track your work on a spreadsheet, it is important to learn the fundamental components of a source citation. In addition, there are numerous programs, apps and websites that can assist you in citing your sources. Creating source citations is like leaving a trail of breadcrumbs for other researchers (and for yourself) so they can see where you found a record and how it fits in with your genealogy research.